We start the 2018 season with our ninth year at one of the major attractions in East Anglia. In 2017 this show moved to a new venue, Euston Hall, which offers excellent access from the major population centres of Cambridge, Bury St Edmunds, Thetford, Newmarket and Ipswich. The show is extensively publicised throughout the region, through e-shots, magazine adverts, radio advertising and social media. The show regularly attracts an attendance of approximately 40,00 visitors every year, and 2017 saw a record attendance. They will fnd on offer a wide variety of activities for the whole family. There is clay pigeon shooting, dog shows, fly fshing, imaginative children’s activities and cookery demonstrations. 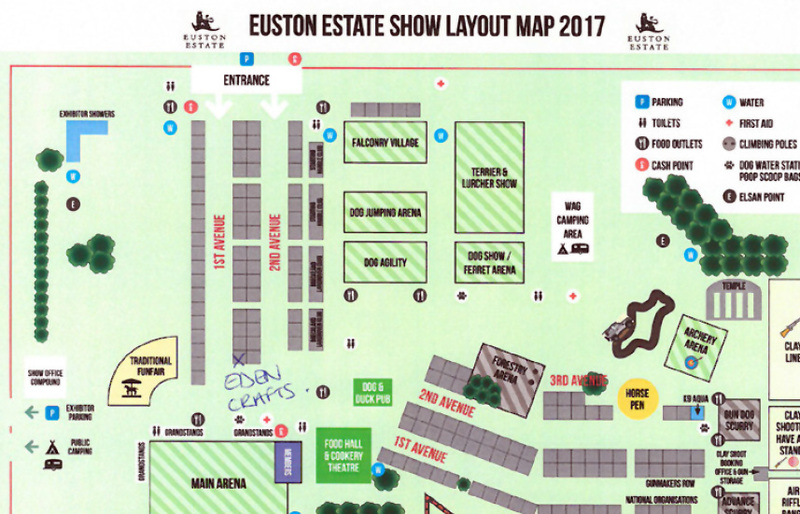 The shopping is excellent, with 350 trade stands, and the Eden Crafts marquee is in a prominent position to maximise the opportunity, moving to a new position facing the main ring. There will be a small food section.